Nike Zoom Superfly Flyknit track spike for sprinter Allyson Felix created using rapid 3D prototyping. Nike has made headlines recently by producing custom track spikes for three-time Olympic gold medalist Allyson Felix using HP 3D printing technology. Rapid prototyping potentially can save Nike development and lab time, while increasing its speed to market. The concept for Nike and HP is to make shoes on the fly for football players with either a custom shoe or orthidic. In the last three years, HP has been pushing its 3D printing development and produced Selective Laser Sintering (SLS) that has allowed manufacturer’s like Nike to make and tweak prototypes in hours, instead of months. 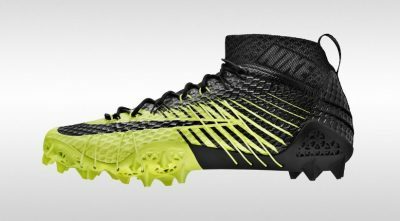 Nike Vapor HyperAgility cleat built using 3D-printing technology. This process has fast-tracked the marketplace is witnessing the creation track spikes to football cleats and the next step is for the 3D printers to have a spot inside NFL locker rooms. Nike has used 3D printers to made shoes such as the Nike Vapor Laser Talon and Nike Vapor HyperAgility specifically for football players. The Vapor Laser Talon was used by several rookies during the 2013 NFL Combine in Indianapolis. The potential for 3D printing inside NFL locker rooms is vast. Don’t be surprised to see situations where players switch to custom-made 3D printing cleats when the weather turns during the second half a game. Or the place kicker switching shoes depending on the length of the field goal. And while Nike looks like it’s ahead of the game with 3D printing other shoemakers like Under Armour, Adidas, New Balance and Reebok are in this game too. HP’s 3D scanning solution called the FitStation has spawned start-ups such as Feetz and Wiiy Wearables who are making shoes and sandals from 3D printed models. The HP FitStation has software that can produce a 3D scan of a person’s foot. According to HP, this method creates a digital profile that shows not just the size but pressure points and gait. Under Armour is using 3D printing to design athletic footwear with lattice that reducing the weight of the shoe. Adidas came out with the 3D Runner in 2016 and has also invested in SLS. Adidas’ next step is with carbon-fibre. They are also working on a 4D shoe. Reebok has the Liquid Speed shoe that is constructed with polyurethane and wraps around the foot from the underside and laces up from there. Possibly the first athletic shoemaker with a 3D printing strategy was New Balance but only for the mid-sole portion of the shoe.